It has been noticeable in the past ten or fifteen years that the rabbit population is recovering after myxomatosis, and numbers must now be approaching something like their pre-1953 level. The new breed of rabbit seems not only more resistant to the myxoma virus, but also more enterprising in choosing a site for a warren. Along part of Under the Heavens Lane, a deep and narrow thoroughfare running the length of a dry glacial valley, the northern hedgebank is riddled with rabbit holes. The rabbits themselves are multiplying as only rabbits do, and may often be seen sitting by their burrows basking in the sun, or making excursions into the adjoining field for titbits of salad. The lane is fairly quiet, and the warren, now that farmers have more profitable things to do than set snares, is reasonably safe from disturbance. Recently, though, this paradise was violated by what must seem to a rabbit like the Angel of Death. From my bicycle this morning I glimpsed a lithe, upright form seated arrogantly on the sawn surface of an old fence post. Its fur, as soft and luxuriant-looking as anything at Harrods, was marked with a pattern of umber and champagne, and made a bandit’s mask round the eyes, which had the fierce, mad gleam of the professional murderer. In the first instant the word “polecat” flashed into my mind; but this animal was too pale to be that, and besides, there are no longer any polecats in this tame, thoroughly domesticated region of the Home Counties. No: it was an escaped ferret, and it had taken up residence in the rabbit warren, to the terror and consternation of all those within. Now the ferret was living the polecat’s life, a far cry from guest appearances at the village pub or spending the evening in someone’s trousers. On taking its freedom, it had immediately gone native, true to its nature and ancestry, for the ferret and the polecat are members of one of the most bloodthirsty groups of carnivores there is – the genus Mustela. We have two more members of this genus living hereabouts, the weasel and the stoat. The landscape may be ordered and manicured now, and entirely dominated by man, but their independence remains intact. They are both killers, at or near the top of the food chain, and their style is unmistakably that of the assassin. 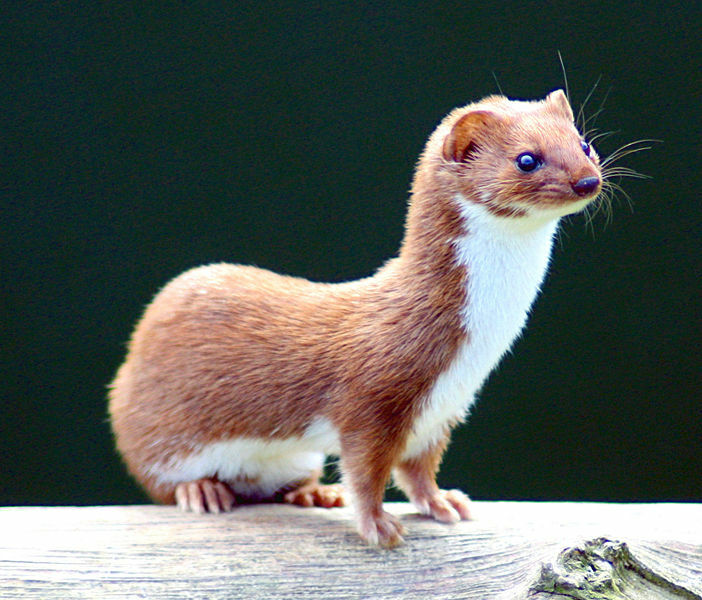 The weasel is about seven inches long, three-quarters the size of the stoat. In general pattern they are both, like the ferret, short-legged and long-bodied, built for pursuing their prey through tunnels and burrows. Both have brown upperparts and white underparts, and small, rounded ears which are usually held at an upright and inquisitive angle. The stoat can always be told by its longer tail, tipped with black. In winter the stoat usually turns white, and then its fur is called ermine, but the black tail-tip remains. In more northerly climes than Britain the weasel turns white in winter too. Despite rigorous persecution, they both manage to survive in fair numbers, and the weasel may even be said to be common. The most that is usually seen of a weasel is a rapid, low blur as it streaks across the road from one hedge to another. But if you have the time and patience, it is not a difficult animal to observe. Occasionally you will disturb one in the act and it will drop the mouse or vole it has just killed and flee. Keep absolutely still, wait, and the weasel may very well return, giving you the privilege of perhaps half a minute’s clear view. The best place for observation, though, is at the nest, if you can manage to find one. Weasels breed twice a year, giving birth in April-May and again in July-August to a litter of about half a dozen young. The nest is placed in a hollow tree-trunk or a burrow speedily vacated by a family of rats. Now, at the end of May, the first litters are beginning to be weaned. The female alone usually rears the young, and she decides when it is right for her brood to leave the nest and take their first lessons in hunting. She will show them what is edible and what is not, and how to deliver the coup de grâce with a quick, savage bite through the back of the neck. The main prey of weasels consists of small mammals, especially mice and voles. After man, the weasel is the worst enemy of the mole, as is shown by the number of weasels caught in mole-traps. Shrews, though, seem hardly to be taken. The appetite of a hunting weasel is prodigious. As it is so small, the animal’s surface area is large compared with its volume, and it will eat anything up to a third of its own body-weight a day. In practical terms, that means a family of weasels can put paid to two thousand mice and voles a year. Besides small mammals, weasels are not averse to the odd bit of carrion, to birds’ eggs, and to the birds themselves – having been known to attempt one the size of a lapwing. They are fearless, invested with the same instinct as the tiger or puma. In the weasel, and the stoat, there is another element of ferocity too, bordering on the insane. The cause might be traced to a nematode, a parasitic worm with the unpronounceable name Skrjabingylus nasicola, which is present in 10% of young and 70% of adult weasels. The worm progressively attacks the bones of the skull. It may be that stoats and weasels are driven by their own private demons. I don’t know whether ferrets, gone wild, suffer the same fate. If so it would account for that mad gleam in the eyes; and if so, it does not augur too well for the rabbits of Under the Heavens Lane.